The AccountMate Consolidated Ledger module provides the ability to quickly combine several companies’ account balances and budgets into a unified ledger to present consolidated financial statements and other reports. It also supports consolidation of companies with different reporting currencies making it ideal for multi-national organizations that have foreign operations. Creating a consolidated ledger is simple. Just set up the company in AccountMate and specify whether it is a parent or a subsidiary. 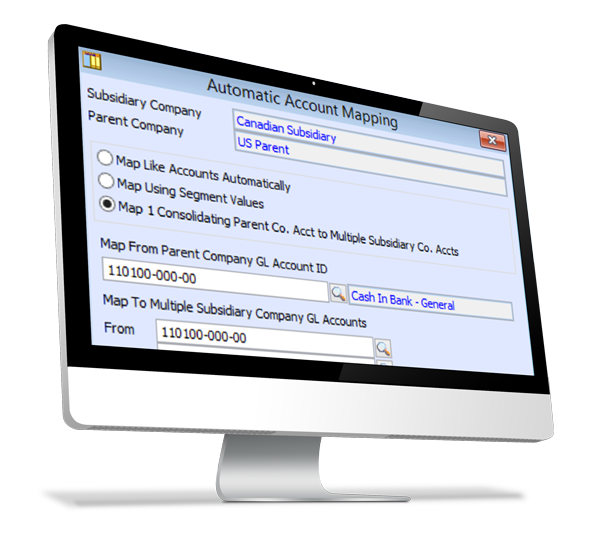 Assign to each subsidiary a parent company that will generate consolidated reports. Then, map each subsidiary company’s chart of accounts and fiscal periods to its parent and you’ll be able to consolidate the subsidiary’s account balances and budgets in no time.